It’s a matter of common sense that paid services have no comparison with free services. Web hosting is no exception, but we will elaborate the difference between two in a more logical manner. Free hosting is not a total rejection. It is good for immature, non-professional and websites with less bandwidth requirements. When it comes to business or high profile hosting, free hosting losses its scope. Such entities require a truly top quality, reliable and supportive system of hosting without any pitfalls. There are certain technical aspects which segregates these both categories of hosting in much more finer way. We are going those aspects in detail to give good account of the two practices. The first component of any hosting arrangement is the allocation of space. It largely depends on the nature of business and turnover of visitors. No compromise on basic space requirement is recommended for bringing value and stimulating sales. Most precise evaluation and generous allocation of space is the only way-out to add real race to your website. This is only possible with paid hosting. You cannot have many choices with free hosting. Those follow already formulated packages which cannot be optimized and customized. 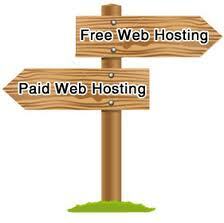 Paid hosting gives freedom and fosters the pace of business. Space is a vital difference between free web site hosting and paid hosting. Data transfer speed is the second most critical and challenging part in web hosting. It’s a matter of serious consideration for the people who seek paid web site hoisting. No one likes to visit the site that gives slow response and consumes a lot of time in processing requests. Instant connectivity is the need of hour. It’s the bandwidth offered by web host that defines the speed of data transmission. Free hosting companies do not offer much freedom in assigning bandwidth; they try to keep it to minimum level for a site to be operative. A good quality website requires, minimum of 5 to 10 GB bandwidth which is only possible in the case of paid web hosting. Like all other forms of support, technical support plays critical role in making any web site hosting company successful. Web hosting companies hire dedicated and dynamic support team to handle the challenging and round the clock needs of their customers. It is a matter of high-cost and it can only be expected from paid web hosting. Free web site hosting seldom offer any support and they likewise those who avail such hosting have minimal need of back up support as well. Web hosting is a very long-term venture and visionary people foresee their future needs at the time of choosing any web host. Paid hosting companies allow maximum e mail accounts to their customers for the smooth operations of affair. Free web hosting has to follow the set patterns and they offer few e mail accounts by keeping in view the package offered. Free web hosting companies have no concern for their credibility as they are offering complimentary services to anyone. Free web hosting is not bound to obey any moral or social ethics as they are not earning any revenue from their customers directly. On the other hand, Paid web hosting is very much concerned about their reputation and they try their level best to offer unforgettable experience to their clients and visitors. Next post: How Important to Back up you Hosting Files?